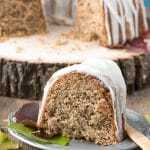 This bundt cake is full of winter spices and is a wonderful way to use fully ripe persimmons. My pick is ripened Hachiya persissons which give it a light, sweet flavore. Though this cake is gluten free it was adapted from a gluten cake. For those preferring to use gluten all-purpose flour merely substitute it for the full flour amount (2 1/4 cups) or for the gluten-free all-purpose flour and still add the oat flour. In my experience gluten-free cakes have the most structural integrity if they are allowed to cool fully. I prefer not to use gums in my baking, being able to tell they have been used in the taste and texture. There are no gums in this cake either so letting the cake fully cool is important. Place the oven rack in the middle of the oven and preheat the oven to 350 degrees F.
Prepare the Bundt pan: using a paper towel with softened butter (start with around a half tablespoon), generously wipe the butter fully over the internal cavity of the Bundt pan, including the middle cone. Remove any excess butter. Generously dust flour into the buttered pan, rotate it tapping the outside to spread butter over the butter. Turn upside down and tap out excess flour; tapping the pan while upside down on a firm surface. In a medium mixing bowl, combine the all-purpose flour, oat flour, baking powder, baking soda, xanthan gum (if making the cake gluten-free), allspice, cinnamon, ginger and salt; whisk to fully combine. In a second medium size mixing bowl, combine the persimmon puree, buttermilk and vanilla extract; whisk together until smooth. On medium-high speed, beat together with a mixer the 1 ½ sticks butter and granulated sugar for 3 minutes until light colored and fluffy. Add eggs, allowing each to blend in before adding the next; beating to fully incorporate into the butter-sugar mixture. Reduce mixer speed to low. Starting and ending with the dry ingredient mixture, alternate adding the dry ingredient mixture and the persimmon mixture. Beat only to combine; do not over mix. In the bowl of a mixer combine the sifted confectioner’s sugar and the melted butter. Beat on low speed to combine. Add the remaining ingredients (bourbon, orange extract and milk/cream) beating on medium speed until smooth. Place the cooling rack with the cake on a baking sheet with sides. Pour the glaze over the cake evenly (I use a liquid measuring cup and pour from the inside to the outside and back). Allow glaze to set before serving (about 10 minutes). *To make Persimmon Puree scoop the flesh from inside 1-2 fully ripe persimmons (I use Hachiya persimmons). Add the flesh to a blender and blend just until pureed.